This month’s reading prompt was books that have been adapted to the screen whether that be for movie or tv. There’s big business in it and sadly, I’m often too far behind the book wagon to jump on and instead just catch the movie bus as it strolls by. Regardless of the similarities, there are always major differences between the print and the screen, some great adaptations and some really poor adaptations but they definitely keep Hollywood turning. 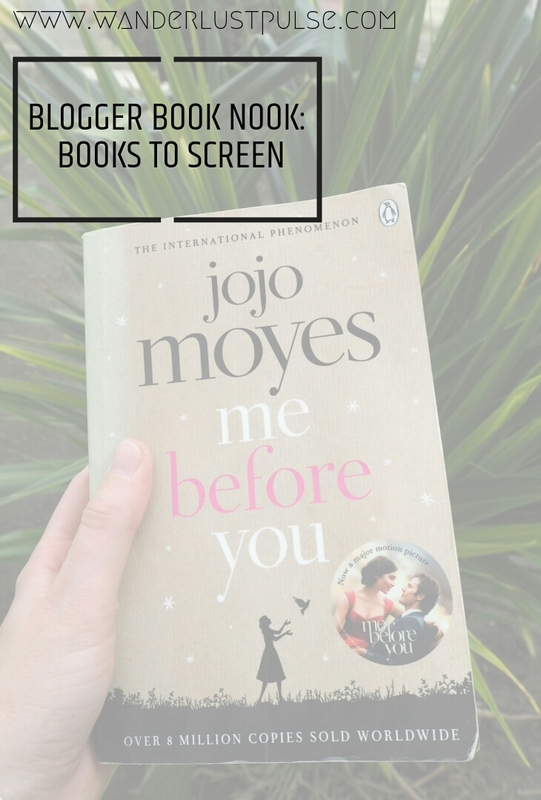 What’s your favourite book to screen adaptation? Why? I loved One Day. Honestly, I watched the movie before I read the book but I fell so in love with the story and characters that I just had to read it. To my surprise, the film was very true to the book and included a lot of elements that weren’t necessarily important to the shorter storyline of the film but were to the book. What’s your least favourite book to screen adaptation? Why? I’ve got to say The Hunger Games. Don’t get me wrong, I love the movies but only as movies and not as adaptations. The movies were strong but the books were stronger. So many small elements of the book which made a big impact were left out of the movies, presumably because the director didn’t think they were important but they really altered the storyline of the movies. What book would you most like to see on screen that hasn’t been adapted yet? Do you always read the book before watching the adaption? I like to because the books always hold a lot more depth than the screen versions and you fall into the world of the story a lot more. However, I am often late to the party with books and the film is usually out before I’ve even heard of the book so sadly, I often jump ahead and then never end up goinhg back to the book. Does seeing your favourite characters on screen ruin how they appear in your imagination? Sometimes. Sometimes casting directors get it all wrong and that’s annoying. However, sometimes they hit the nail on the head and then it really brings the characters to life. If the characters are wrong on the screen, I always find it difficult to follow the movie as I’m just thinking about how wrong it all is. It would never ruin the book but it does ruin the movie sometimes. About two years ago, I started to watch this movie and turned it off after 20 minutes. I don’t remember why. I have no idea whether I just didn’t have time or whether I didn’t enjoy it. Around the same time, I also nabbed the book and the sequel from the book shelf in my hotel and kept them in my desk drawer with the intention to read. Unless a rep since has removed them from the drawer then that’s where those books remain. Recently though, Jojo Moyes has been popping up a lot on the hotel book shelves and I’ve taken quite a few to add to my reading collection so when Me Before You appeared, I had to take it too as I knew it would be perfect for this month. Me Before You is the story of Lou Clark and Will Traynor. Lou Clark is in desperate need of a job and takes one as a carer for Will who is a quadreplegic following a motorcycle accident. The story follows the highs and lows of their six months together and how from their rocky start they had a tragically beautiful ending. I loved the characters in this book, Moyes made them so real and relatable that it was an absolute delight to read. So much raw emotion pours from every page and I was absolutely hooked. The ending of the story made me cry… and I have honestly never cried from a book before. I was an absolute emotional wreck. It was so easy to invest in the characters and a real joy to read their story. I will say however, that spoiler alert I was a bit disappointed when they fell in love. I thought their friendship was so special and golden that I just wanted it to remain as that. After reading the book, I had to watch the movie. I thought the characters were really well presented however, that may have something to do with I knew what the actors looked like before reading the book. I also loved that the script stuck very closely to the book narrative and included an awful lot of the dialogue. The movie was great but honestly, not a patch on the book. I still cried at the end but I couldn’t tell you if that was because of the movie or because I was reliving the book. If you haven’t read Me Before You then I would highly recommend! I hate when casting directors get it all wrong and the characters from the book just don’t live up to the expectations you envisaged in your head. Also, loved your review of your Me Before You. Ah, I love a good book nook post! I love this post! I totally agree with you about the hunger game films. I loved the books, I got through all three in a week so I was excited when they were being made into films. Like you said the films were good but the books, particularly the first one for me, were stronger. I was actually contemplating this book when deciding what I wanted to read for this prompt so after reading your review I will definitely be putting it on my TBR! I haven’t read Me Before You or seen the film, but I have plans to. My sister just told me it’s on Netflix, so I have my Saturday evening planned now. I agree about Hunger Games. I liked the first movie, but the other movies I just couldn’t get into. Is it?! It took me three days to download it haha! I love reading and feel like, on average, the books still end up being my favorite when compared to a movie remake. However, there is nothing more satisfying than a movie that is made nearly spot on to a book! It’s so neat to see the characters come alive on a screen! Me Before You is such a heart breaking story! I 100% agree with you however though, I wish their friendship was the sole story line as it was so beautiful.